Join South Carolina ETV host Beryl Dakers for the extremely rare experience of witnessing a 100% total solar eclipse on Monday, August 21, 2017. 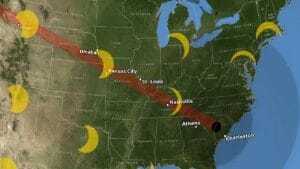 South Carolina is a prime location for the total solar eclipse, which will cross the U.S., coast-to-coast, for the first time since 1918. Dakers and guests will follow the “path of totality” and capture images from the South Carolina State Museum Observatory telescope. NASA will also provide live streaming coverage, available from 12 p.m. to 4 p.m. (including a “pre-show”), available to view below! Additionally, CPTV will air the NOVA special “Eclipse Over America” on August 21 at 9 p.m. For more information on that, click here.